Hey, folks. Matthew Weiss here — weiss-sound.com, theproaudiofiles.com, and mixthru.co. I want to talk about parallel processing. So what is parallel processing? 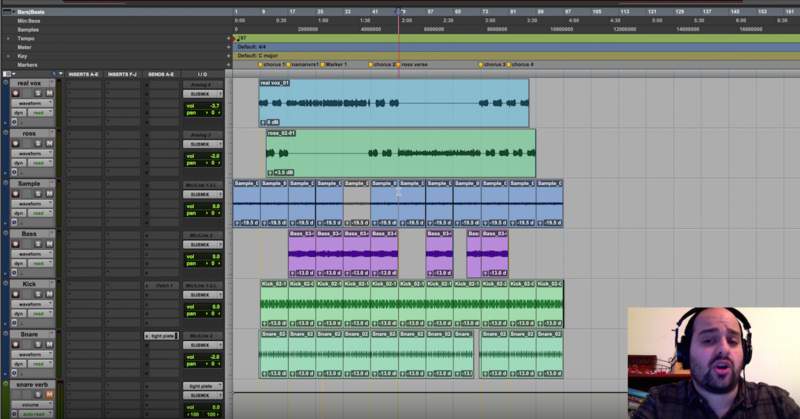 Parallel processing simply means taking an audio track, like let’s say an acoustic guitar or a vocal, and duplicating that track in some way, shape, or form — either by literally copying an identical track so that you have two playing simultaneously, or by sending it off to a separate aux and playing it along with the main channel. Whatever it takes to get multiple versions of the exact same thing playing. Then you affect the duplicate track differently than the original track, and that’s very important to the concept. So one really common example of parallel processing is parallel compression. If you’ve seen my other tutorials, you know that I do it on vocals pretty often — especially rap vocals pretty frequently. That would be taking the original rap vocal — one mono channel — duplicating it, compressing the snot out of it, then blending that duplicate in usually somewhere about -10 to maybe -16 dB, depending on how much it needs underneath. So a really heavily compressed version of the main vocal is, you know, ten to fifteen decibels quieter playing at the exact same time with the original vocal. Alright, so here is what we need to know about parallel processing. The key is that our duplicate track, whatever we’re trying to do with it, or our multiple duplicate tracks, are different than the original. So let’s say that we have an acoustic guitar, and we simply duplicate the track, and we just play them both simultaneously. The only thing that happens is that we get a louder version of the identical playback. It’s literally no different than simply turning up the volume on the original track. One thing that I see tossed around the internet quite frequently is this technique of widening vocals, or thickening vocals, or I don’t know what exactly is being attempted to do with this technique that does not work, but the idea is to take multiple copies of the same vocal, you duplicate — you have the original, and then you duplicate one, and then you duplicate it again, so you have now two identical copies, and you pan the one duplicate off the left, and you pan the other duplicate off to the right, and this is supposed to in some way, shape or form, make your vocals thicker, or wider, or louder, or fuller, or whatever. It really just makes them louder. Here’s why. The vocal — the original vocal, as a mono track — is not playing out of a center speaker. It is playing out of both speakers — the left, and the right. It essentially is a stereo feed. It is feeding the left and the right speaker. What makes it sound like it’s coming from the middle is that the left and right speaker are playing the exact same sound, at the exact same time, at the exact same level. Our brain goes, “That’s coming from the middle!” Because it doesn’t know where else to put it. If you duplicate the original track two times, and you pan one hard left, and one hard right so that those duplicates are playing out of their respective speakers at the same time, at the same level, all you’re getting is a louder version of a center image. So you’ve effectively done nothing except for turn your main vocal up. Now, when you turn your main vocal up, it does create the illusion of something being wider, or fuller, or bigger, because it’s louder. Sometimes, that’s really all you want to do is to just turn the vocal up, because sometimes that’s all that it needs, but that’s not actually doing anything to actually thicken the vocal, or change it in any real way. So, if you wanted to create a wider vocal doing something similarly, what you could do is make those two duplicates, and then pitch shift the first one down about six cents, and pitch shift the other one up about six cents, and pan the one to the left, and the one to the right, and maybe tuck them both down about twelve decibels. What that will do is create an effective chorusing kind of feel where there is now some kind of stereo separation, because what’s happening on the left speaker is not identical to what’s happening on the right speaker. So this would be a parallel chorusing effect, and that will give the feeling of your vocal being a little bit wider. Of course, it’s also going to create some phase discrepancies, so you have to be a little judicious about how much you’re going to do something like that, but that’s one technique using parallel processing to accomplish that thicker, fuller, wider sound. Alright guys, that’s just one of many. Maybe I’ll write an article and I’ll just do a huge list of parallel processing techniques that you can use, but in any case, that should give you an idea as to what parallel processing is and what it isn’t, and some ideas for techniques that you can create on your own. Alright, anyway guys, until next time.